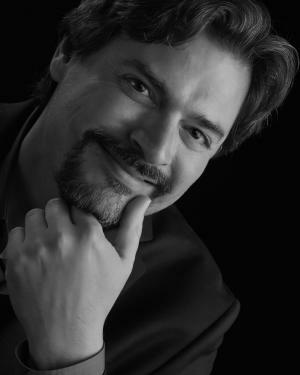 Composer/pianist Carter Pann has written for—and worked alongside—musicians from around the world, including performances by the London Symphony and City of Birmingham Symphony, the Tchaikovsky Symphony in Moscow, radio symphonies around Europe, the Seattle Symphony, the National Repertory Orchestra, youth orchestras of New York and Chicago, and many wind ensembles. He has worked with clarinetist Richard Stoltzman, the Antares Ensemble, the Capitol Saxophone Quartet, the West Coast Wind Quintet, the River Oaks Chamber Ensemble, the Takács Quartet, the Flute New Music Consortium and many concert pianists. Awards include a Charles Ives Fellowship, a Masterprize seat in London and five ASCAP awards. His numerous albums encompass solo, vocal, chamber, orchestral and wind music and have received two Grammy® nominations to date. Pann was a Finalist for the Pulitzer Prize in Music in 2016. In his spare time, he challenges his students over the chessboard.